In the new play Nellie, The History Theatre does what it does best - educate the audience about a little known chapter of Minnesota history while telling a compelling story on stage. 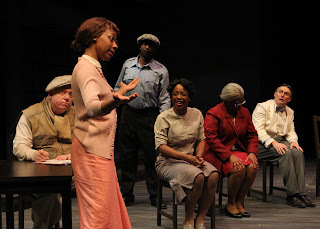 Despite having grown up in the same town as influential union organizer and civil rights activist Nelllie Stone Johnson, I had never heard of her before seeing this play. Playwright Kim Hines gives us the elder Nellie as the narrator of her own story, as we follow her from her childhood on a farm where she helped her father organize farmers, through her years as a student at the University of Minnesota, to being hired as an elevator operator at the Minneapolis Athletic Club, where she organized workers to demand fair pay and employment practices. 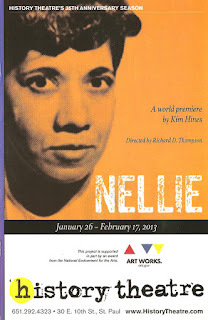 The play covers the beginning of Nellie's life as a leader, and left me wanting to know what happened next. 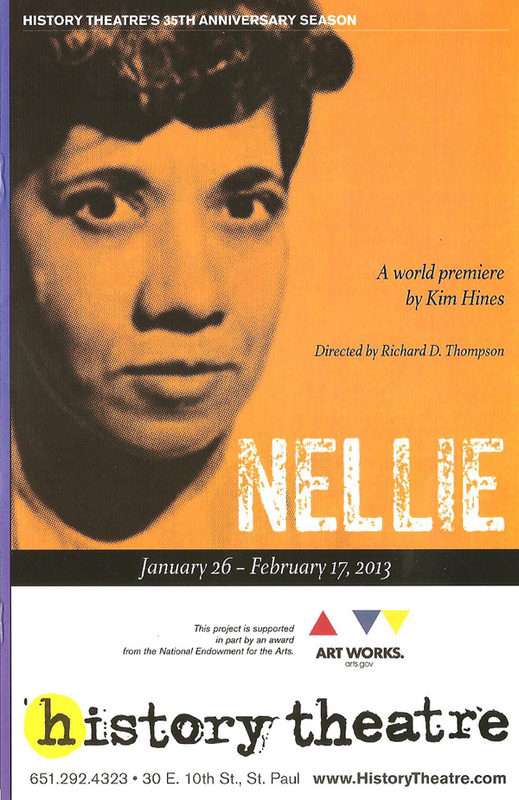 I'd be interested in seeing Part II of this play, in which Nellie becomes the first black elected official in Minneapolis, counsels two of Minnesota's most famous politicians (Humphrey and Mondale) in Civil Rights issues, and helps to found the Minnesota DFL. Still, Nellie shows us how this Minnesota farm girl, "born the wrong gender and the wrong color" (as she says about her college-educated mother), became one of the heroes of our fair state. Greta Oglesby plays the elder Nellie, who serves as the narrator of her life. It's a clever device in which Nellie interacts with her own past as she shares it with the audience. Despite all that she's accomplished in her life, she displays some uncertainty and perhaps even regret at not having said or done what she now, in hindsight, believes she should have. Several times in the play, the young Nellie (Shá Cage) says something, only to be corrected by the older Nellie - that's what I wanted to say, but what I really said was this. How many of us would like to rewrite scenes from our past? But our guide Nellie makes sure to convey the truth of her story, even if it takes a few tries to get it right. Greta and Shá both give strong performances as the elder and younger Nellie. Greta is the wise woman at the end of her life, while Sha transforms from the young and uncertain woman to someone who recognizes unfair treatment and steps up to fix it. It's an almost physical transformation; at the end of the show, when the two Nellies are standing side by side, they almost look like the same person. They're supported by a strong ensemble of actors playing multiple roles, including Ron Collier, who gives a mighty speech as a preacher against the unions. Two Opening Nights in St. Paul, two excellent Michael Hoover set designs. In addition to Johnny Baseball's movable bleacher platforms, he designed a somber and stately backdrop for Nellie's life. The wall of a building with large windows resides in the back of the stage, which serves as Nellie's elevator in addition to windows in which we see silhouettes of voices from Nellie's past. In front is a sparse open space with a few chairs and tables. It's a simple and entirely appropriate environment for this story to be told.